Please Note: The Zavio F1105 is no longer manufactured, please refer to the Zavio F3107 as a replacement. The Zavio F1105 is a small IP camera with 720p HD resolution resolution (1280 x 720p) and built-in wireless networking capability. The F1105 supports 802.11 b/g/n wifi or it can be hard wired to your network using CAT-5 / Cat-6 cable. The Zavio F1105 uses a megapixel progressive scan CMOS sensor and 1.7mm fixed lens which provide a wide high definition view. View sample images and a sample video here. The surveillance video from the F1105 can be viewed remotely over the Internet from both Windows and Mac computers. Mac users, please read this before purchasing. Users looking for an affordable wireless IP camera for their home or business that is small, yet has a full feature should consider this camera. The Internet Explorer web browser can be used on Windows PC to login to this camera. On Macintosh computers, the Safari, Firefox, or Chrome web browsers are used. Click here to watch a remote view video demonstration using a Zavio IP camera. iPhone and iPad viewing is supported using the Free iCamViewer app. Click here to watch a video of the iCamViewer app. 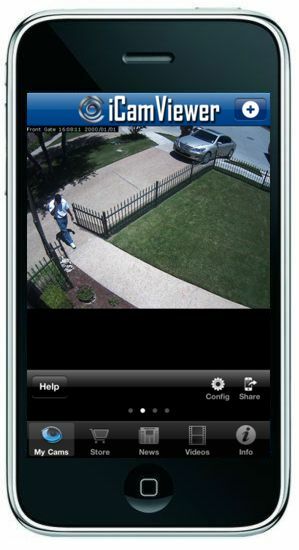 View sample remote monitoring pictures using Zavio cameras. Zavio cameras include, the CamGraba, a 64 channel NVR software license for free. The Zavio NVR software is compatible with all Zavio camera models and runs on Windows based computers. The CamGraba software allows up 4 cameras to be remotely viewed simultaneously. Some additional features are: motion detection and schedule recording, supports H.264 / MPEG-4 / MJPEG compression, multiple access levels with password protection, powerful search functions, enables remote access via the free CamGraba iPhone app. CamGraba iPhone and iPad apps are now available also. The Zavio F1105 is compatible with the Free iCamViewer app. The Zavio F1105 supports live remote viewing over the Internet from a Mac computer, however, Zavio cameras can not record video directly to a Mac. For Macintosh users that are looking for a surveillance system that can also support recorded video playback from a Mac, we recommend using Zavio cameras with the NUUO NVR Titan recorder. It is highly recommended that Mac users read our Zavio IP camera FAQ for Mac before purchasing. The following surveillance snapshots were taken in an office at CCTV Camera Pros headquarters in Lantana, Florida. This room is 15 feet wide and 29 feet long. So, from where the camera is located, the wall at the opposite end of the room is 29 feet away. We took one sample snapshot with the camera resolution set to 720p (1280 x 720) and the other set at VGA resolution (640 x 480). Please click on the below images for a full sized view of the snapshot pictures.